Note: I have not had internet or access to a computer for 3 days now:[ This is the first time I've been able to temporarily connect, so I'll be posting my TT post [which was written but wouldn't post] and some more that I'd wanted to schedule. So sorry about this!! Guys, I'm freaking out.. It's my first day of my senior year at college!! :[ What the heck?! I have the perfect mani on right now, so it's making me a little happier. But still. So weirded out right now.. I can't believe how fast it's gone by! 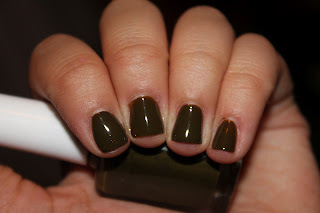 I know you all want to see my fugly nails heehee;] This is actually one of my favorite polishes on me. Last time I wore this, I got a lot of compliments from my more fashion-forward friends. But it is such a strange color, and I'm sure it doesn't float everyone's boat, so I think it qualifies as a fugly polish, yes?? Without further ado, here's 2 coats of OCC Swamp Thing! Love or hate?? I really want to know what you ladies think!! Make sure to look at the other TT posts! I'm really torn on this one. 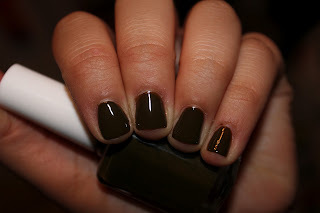 I love me a good swampy color, but maybe I'd love it more if it had less brown...? I dunno, this is a tough one! It's something I might wear once or twice! I like browns so this isn't so fugly to me. The name though, might turn me off a bit.